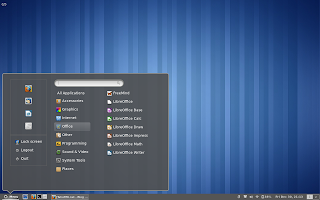 Cinnamon is a fork of GNOME Shell developed by Linux Mint Team that brings innovative features of GNOME Shell and simple layout of GNOME 2. Before we jump into the rest of article, please take a look at the figure below. As you can see, Cinnamon comes with single panel contains "menu" button on the left, followed by "quick launch" icons and window list. Indicator applet and another notification icon is positioned on the right of panel. Pretty simple, huh? Application launcher is simplified too, with single large box containing installed applications shortcut, favorite applications, and session control to logout, etc. Now, you may logout and select "Cinnamon" on session choices when login. Cinnamon is in early development, so use with your own risk!